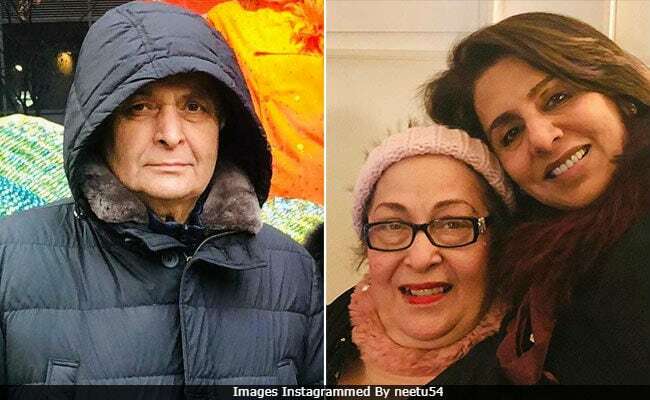 On Sunday night, Neetu Kapoor shared a set of pictures on her Instagram timeline and revealed how Rishi Kapoor spent his time while she and the other 'girls partied.' Rishi Kapoor is currently undergoing medical treatment in the US, and he and Neetu Kapoor are now joined by family members like Rima Jain and Nitasha Nanda. Rishi Kapoor went out shopping and meantime, Neetu Kapoor partied with sister-in-law Rima Jain and niece Nitasha. "While Kapoor saab went shopping, the girls partied," read Neetu Kapoor's caption. The couple moved to the US in September for the treatment, but what exactly he's being treated for has still not been disclosed. Here's what Neetu Kapoor posted. In September, Rishi Kapoor tweeted that he is "taking a short leave of absence from work" and going to the US for medical treatment and requested everyone "not to unnecessarily speculate." However, it was speculated that the 66-year-old actor had been diagnosed with cancer, but the reports were dismissed strongly by his elder brother Randhir Kapoor. Rishi and Neetu Kapoor' son Ranbir had also accompanied them to New York. He returned to India a month ago. When Ranbir was there, Neetu Kapoor shared two pictures of the actor with heartwarming captions. Here are some of the other updates from Rishi and Neetu Kapoor's US diaries. Priyanka Chopra, Anupam Kher and Sonali Bendre also met the couple. Ms Bendre, who returned to India last week, was undergoing cancer treatment in New York. Neetu Kapoor and Sonali Bendre also attended Priyanka Chopra's bridal shower. On the work front, Rishi Kapoor was last seen in Netflix's Rajma Chawal, which released recently.